Hi! My name is Greg Woronchak, a freelance commercial artist from beautiful St Hubert, Canada. My experience includes animation design and storyboards, illustration work, role-playing game covers, and independent comics (including webcomics). I've produced designs and pages for TruFan Publications, Main Enterprises (The Chronicles of Reverend Moore), Modern Myth Press, Dangermagnet!, and Argo Comics (Teen Machine). My storyboards have been used for episodes of Tripping the Rift and Sagwa the Chinese Siamese Cat. I've also provided storyboards for video games such as Prince of Persia: The Two Thrones. 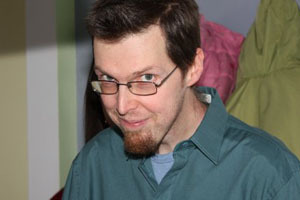 I've competed twice at Zuda.com as webcomic artist and creator.